Caribou in Alberta are shifting their range up into the mountains to avoid human activity, a new paper from the Caribou Program has found. Woodland caribou are listed as a Threatened Species in Alberta. Many herds now have fewer than 100 individuals and continue to decline. 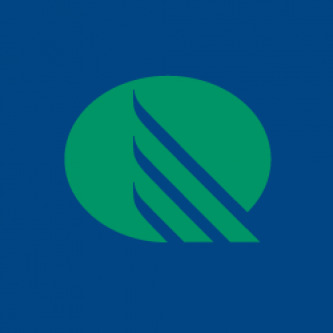 People are probably the main cause; where roads are built and where industry works on the landscape, the caribou fare poorly. 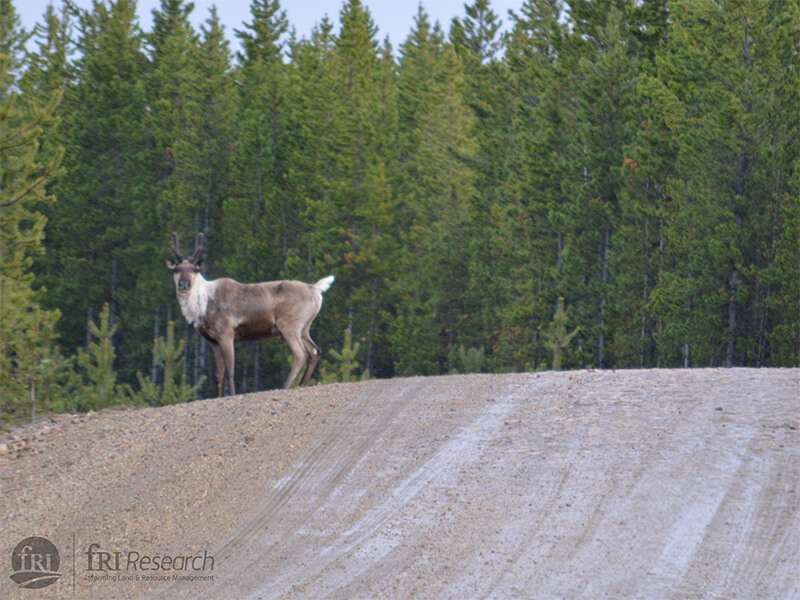 The new paper describes how caribou from two Alberta mountain herds, Narraway and Redrock-Prairie Creek, have shifted their home ranges over a period of 15 years so that they spend more time in high elevation habitat during spring, and linger longer in fall and early winter before returning down the slopes to the forest. In this way, the herds have continued to avoid signs of human use despite the area of clear-cut logging, roads, and oil and gas wells growing with their ranges from about 500 km2 to almost 1200 km2 during those 15 years. Since 1998, the forestry company Weyerhaeuser and the Government of Alberta have been monitoring herds by putting GPS collars on adult female caribou. The collars transmit their position for two years before automatically detaching. The goal is to get collar data from approximately 10 animals from each herd every year, and by 2013, 93 caribou had been monitored in the Redrock-Prairie Creek herd, and 59 in the Narraway herd. Caribou Program biologist Doug MacNearney and his co-authors used the collar data to calculate each collared caribou’s movement rates to identify the start and end of their seasonal migrations. They then calculated the size of the herd’s range in each of those seasons and the different kinds of habitats based on elevation and the plants that characterise the area. For example, the average home range size for caribou in the Narraway herd is just about 4 km2 when calving, which makes sense given how short the calving season is and the low movement rates of females at such a delicate time. That is also the time that the herd is highest up in the safety of the mountains, at an average elevation of over 1700 metres. That home range up in the alpine is just 16% conifer forest. On the other extreme, the average home range size in early winter for that same herd is 75 km2 as the caribou complete their migration down to the foothills (their home range at this time is 73% conifer at an average elevation of 1300 metres). The final step was to look at how those characteristics—habitat, home range size, movement rate, etc.—changed from 1998–2013 and how that was related to the growing habitat disturbance down in the foothills. 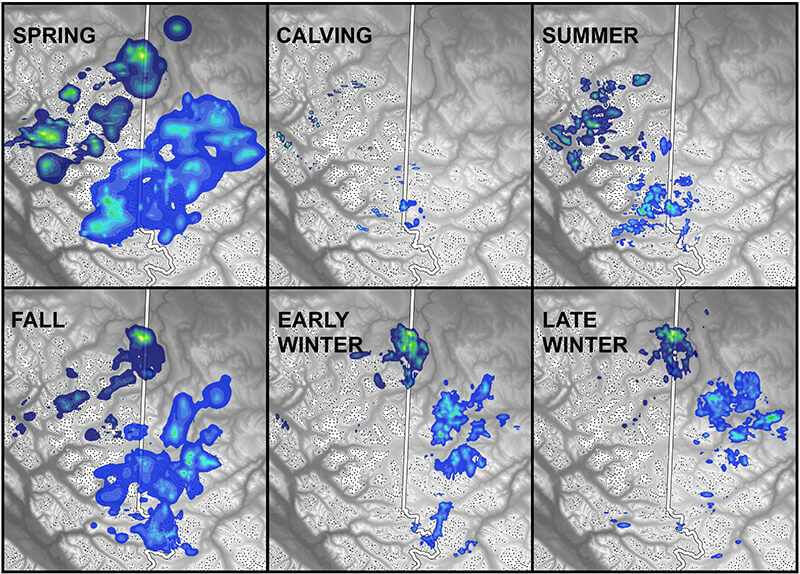 The paper’s authors used a clever new application of an old method, where they treated the distribution of disturbance as if it were another animal on the landscape instead of one of the control variables. 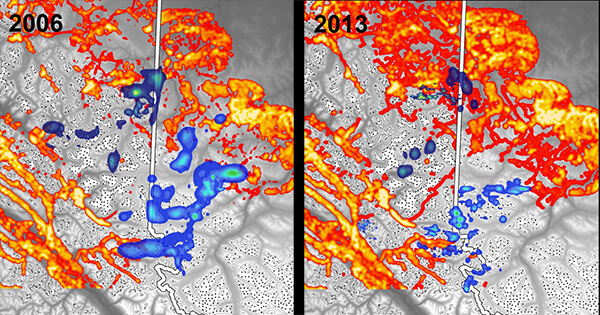 This has the huge advantage of letting them directly compare where the disturbance is with where the caribou were between 1998 and 2013. What they found was that despite the increase in human activity, the herds maintained their very low overlap with disturbed areas. As disturbance grew down in the foothills, the caribou spent more time up in their alpine refuges during the winter, when they would normally descend to the forest. We know that caribou, like other ungulates, shift their ranges to lower quality habitat to avoid disturbance. This could give them a respite from the threats that disturbance throws at them, such as stress, more predators, and vehicles, but there are downsides. There is only so much alternative habitat that can sustain the herds. If caribou spend more and more time in alpine habitat during the winter when conditions are harsh and food is scarce, they could face worse body condition, fewer calves surviving and greater risk of disease. A home range that includes more alpine might also increase their risk of being wiped out in one unlucky event, like the avalanche that killed the Banff herd. It will be vital to monitor how caribou ranges are changing in order to keep conservation planning current. 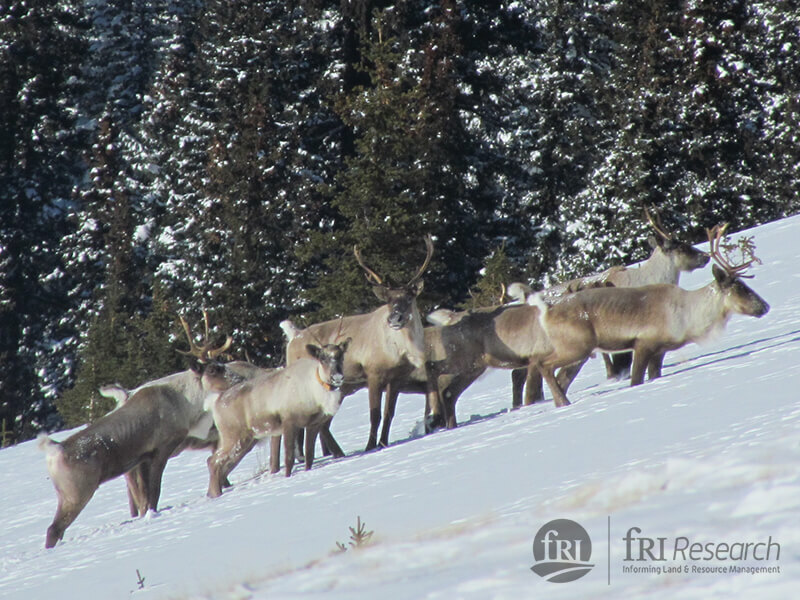 To this end, the Caribou Program at fRI Research has a suite of projects that are providing government and industry the tools and information they need to stabilize, recover, and sustain caribou populations in Alberta. Doug’s co-authors are wildlife biologist Karine Pigeon, Laura Finnegan and Gord Stenhouse—the fRI Research Caribou Program and Grizzly Bear Program leads respectively, and UBC’s Wiebe Nijland and Nicholas Coops. The paper, “Heading for the hills? Evaluating spatial distribution of woodland caribou in response to a growing anthropogenic disturbance footprint” was published in Ecology and Evolution.